These sculptures are a created out of surfboard foam, fiberglass, and resin. Each piece is a one of a kind original, no molds, just skills. So unique they can't be imitated. So much work that we only make a couple every year. Weeks turn into months on these rare pieces of art, as our quest for perfection is not overlooked. The Two Crows collaboration with Carl Olsen and Welzie create some of the coolest shark sculptures out there. If you have an idea that you would like to turn into a sculpture, let’s chat! Commission pieces are such a fun way to explore and challange the creative spark. Welzie has always had a thing for maps and globes, now Welzie is channeling those inner child projects with his creative medium. All sculptures are handmade giving them a unique organic feel. Welzie’s mom was a science teacher and was always collecting skulls and skeletons to share with her 8th grade students. This practice has rubbed off on Welzie as his first cow collaboration occurred on a surf trip in Mexico where he painted in acrylics in the dry desert. This skull here is made from fiberglass and resin giving it the signature Welzie look and feel. 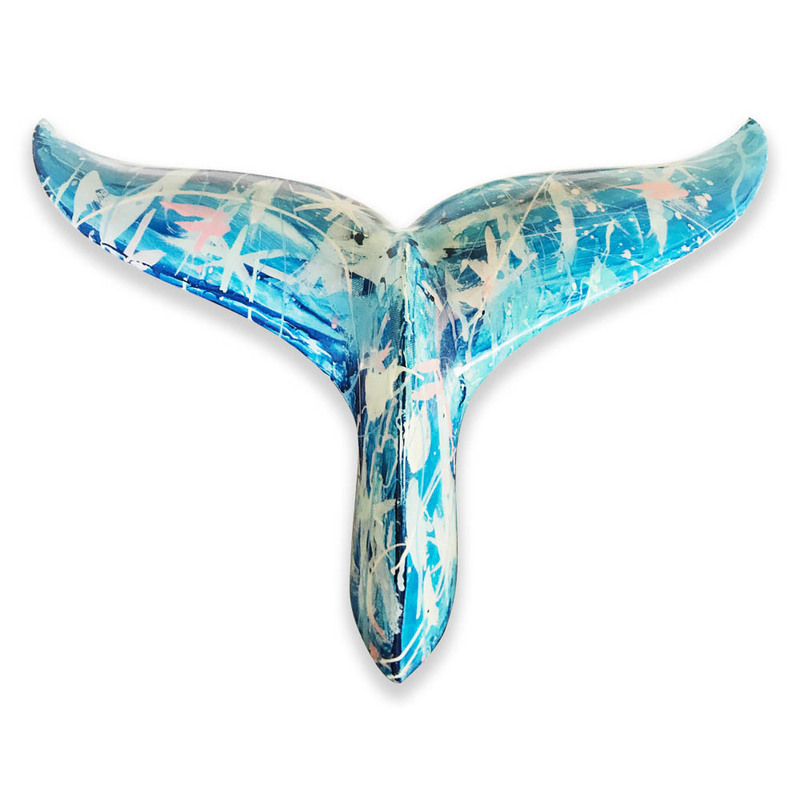 Standing almost 2’ Tall and 36” wide, this hand made Whale tail appears to be coming out of the sea. a 6' Hammerhead gliding through the water. Male and Female dolphins swimming side by side. Each one of the beautiful creatures is about 6.5 feet long and two feet wide. These unique sculptures are hand crafted by Carl Olsen who has decades of experience in shaping and creates each piece from scratch, with no use of molds. The combination of Olsen's clean surfboard lines and Welzie's abstract color work, provides a wonderfull balance of opposites that has birthed a new line in the Welzie Art Family. We never stray too far from our surf roots and the creation of our sculpture family begins in our shaping room at the two Crow Surf Factory on Oahu's North Shore. These pieces are glued together to help create the core in which the animal's body is shaped out of. Using proprietary techniques these blocks of foam start to create the lifelike creatures. So much personality of the creature is translated by the shapes of the fins. Each fin is hand made and carefully glassed onto the body to create an energy that brings it to life. The curves, foils and placement of the fins can change the entire look and feel of the sculpture and much significance is placed on this step. layers and layers of colors are applied which giving the sculptures a unique depth and individuality hard to duplicate with other mediums. It can take Welzie weeks to apply the right amount of colors to each piece, vacillating between too much and too little is what makes Welzie an expert. The sculptures take such a large amount of time to produce it is no wonder we only create a small amount of these stunning three dimensional animals. A master craftsman with a natural gift of sculpting, Carl Olsen has the ability to turn a vision into a reality. From welding, wood working, composites and more, Olsen has the skills to move the new line of sculptures into larger and more complex installations. Olsen has always been passionate about working with his hands. From cars as a kid, to becoming one of the top surfboard shapers in the industry, Olsen’s dedication to his craft is unsurpassed. Welzie and Olsen grew up together in Santa Cruz, California. Together they built and created endless projects as kids. Not surprising to those around them, they began to apply their love and passion for working with their hands into a sustainable career. Olsen and Welzie collaborate daily driving each other to continually outdo their last project. Using the their opposite gift sets, they make a dynamic team that is overflowing with creativity and passion. Welzie with a small Hammerhead shark. A beautiful 10' Great White Shark circling above in downtown LA. A very difficult build. The Ahi Tuna. The first shark sculpture collaboration between Welzie and Carl Olsen. A beautiful Reef Shark hanging in the Wyland Art Gallery in Haleiwa.